Models are responsible for handling data storage and the business logic. Viewsare responsible for the layer that the user deals with. Controllers act as the bridge between the Models and the Views. In other words, Views generate your HTML, Models handle your database interactions (and any logic based on that data), while Controllers tie the two together, and are where you place logic that controls where the browser is redirected and what the user can do. 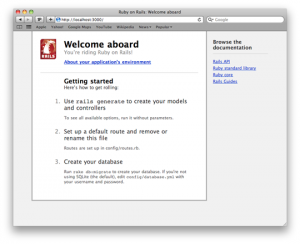 Another more recent option, again provided by Wayne Seguin, is thebootstrap_rails_environment script. 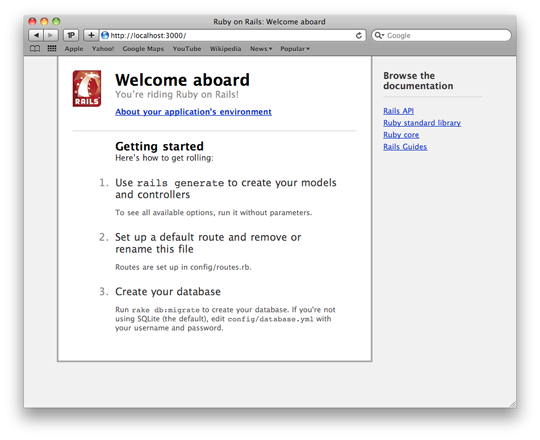 It sets up RVM and all dependencies to have Rails working for users on OSX or Linux. The first line invokes the “db:create” task in rake, a tool (like ant, nant or make in other languages) which lets you run little bits of saved code. In this case, the “db:create” task will create our database (if you look in theconfig/database.yml file, you’ll see it’s going to create a file atdb/development.sqlite3). Next, you’ll want to use your text editor to open up the app/models/urls.rbfile that contains your URL model and the generated Migration file (inside thedb/migrate folder, it will be automatically named with a timestamp followed by _create_urls.rb; for example,db/migrate/20110129184226_create_urls.rb). As mentioned before, it was automatically assigned an id, and also set the<code>created_at</code> and <code>updated_at</code> fields to have the correct value: the time it was created. Where there is no URL with the id 100000, Rails will raise anActiveRecord::RecordNotFound exception in Rails telling us it can’t find a URL with the id of 100000.